The BRICs markets (Brazil, Russia, India and China) are becoming ever larger forces in the world economy. For some time their growth rates have been faster than those experienced in western economies, and they have borne the recent economic crisis with greater resilience. In many ways it’s wrong to refer to the BRICs as “developing” markets — by some measures they can be considered just as developed as the “developed” markets. Manufacturers and service providers have to be interested in the BRICs. Their sheer size, allied with these growth rates, means they offer huge potential. Growth rates in the BRICs for a range of items have been rapid. Data from Global TGI, an international network of market and media research companies spanning over 50 countries and six continents, shows this very clearly. In this post we look at three examples in diverse sectors. 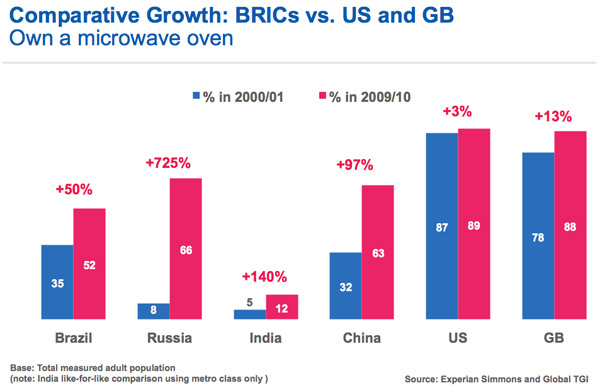 These charts show the trend over the last decade in the ownership in the BRICs markets of cars, microwave ovens and bank cards. They are based on the total measured urban adult Global TGI population in all cases. We can also compare this with the trend in the U.S. sourcing data from Experian Simmons. There has been dramatic increase in the ownership of cars over the last decade in Russia (80%), India (90%) and China (200% growth). These rates of growth are a clear sign of how economic development spreads wealth and makes items affordable to increasing numbers of consumers. The exception to this picture is Brazil, where car ownership was considerably higher than in the other BRICs at the opening of the new century, and growth has been more serene. 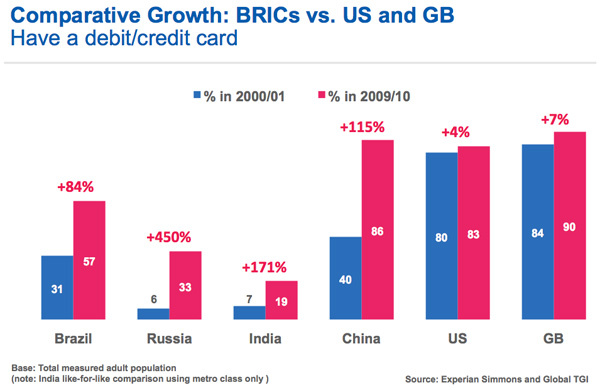 By comparison to the BRICs we see from Experian Simmons that in the U.S. (as well as Great Britain) there has been virtually no percentage growth — new purchases are largely replacement purchases. Purchasing a microwave oven for your home is by no means as expensive an undertaking as purchasing a car, but it requires the availability of sufficient disposable income. In this category we see from Global TGI significant growth in all the BRICs over the last decade — from a 50% increase in Brazil to over 700% in Russia. The growth story in Russia is typical of many categories in fast-growing markets: ten years ago a microwave oven was still an expensive item for most households given their purchasing capacity, and ownership was largely the preserve of the well-off. Subsequently however, it has become affordable as well as being regarded as necessary by most people, and penetration has grown dramatically. As with automobiles, growth of microwave ovens in the U.S. has remained flat with fully 89% of all American homes already owning a microwave. The growth in ownership of credit and debit cards arises from people’s need to manage money, and greater levels of financial sophistication. Clearly it also represents a huge opportunity for financial institutions. 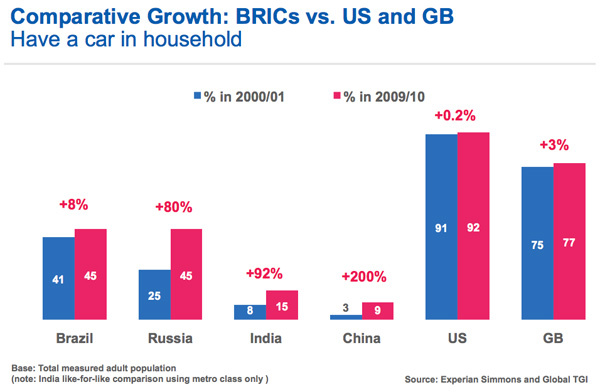 It has been striking across all the BRICS — and there is still potential for more, perhaps in India most of all. Again we see from very little growth over the same period in the U.S. and Britain, which were already saturated. Today, 83% of Americans have a debit or credit card, as do 90% of Brits. Across many other categories the same picture can be seen, of rapid growth yet still much further potential. We can anticipate growth in the BRICs and other developing markets continuing to outpace growth in western markets across the full range of consumption categories. With economic growth happening at different speeds this trend seems likely to last for a long time. Furthermore, it’s not only that they are growing faster. In population terms, the BRICs together represent 42% of the people of the world. Their large populations mean that they will increasingly dominate world markets in absolute numbers too. When this rapid macro-economic development is considered along with the sheer size of their consumer markets and the speed of their growth evident from these Global TGI figures, it is very clear why many manufacturers are focusing attention very closely on the BRICs. Learn more about how Experian Simmons and Global TGI can provide you with consumer insights across the globe with comparisons to the United States.